the actual recipe in the handwriting from the pastry chef who gave it to my grandma from Hotel Muscatine in 1984. Start by peeling, coring and chopping 2-3 cups of tart apples. Make sure all of your pieces of apples are approximately the same size so that they all bake at the same rate. If you find peeling, coring and chopping apples daunting, we recommend using an apple peeler like the one shown here. It'll make your life SOOO much easier and it'll change the way you make any apple dessert! Put all the chopped apples in a bowl and set aside. Now, it's time for the crust. Don't be scrrrrd. If you're choosing to work with store bought pie crust, there's not shame in your game! That'll work too! Start with a disk of pie dough on a well floured surface. Starting in the middle of your disk of dough, roll the dough out to approximately a 12" circle if you're using a 9" pie plate. Once the dough is rolled out to a 12" circle (If it's bigger it'll be fine. You just don't want it to be too thin because it might tear.) Roll the dough half way onto your rolling pin. Place the rolling pin in the middle of the pie plate, with half of the dough hanging over the pie plate. Moving the rolling pin towards you, unroll the other half the dough covering the pie pan. 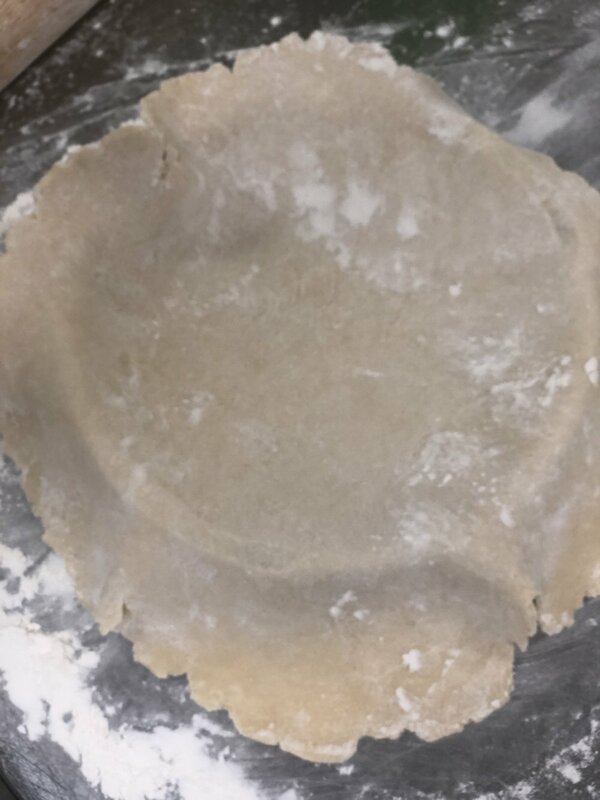 Using a pair of kitchen shears or a paring knife, trim the edge of the pie dough so that you have approximately one inch hanging off of the side. Once the crust is trimmed all the way around the pie, tuck the extra pie dough underneath itself. When it's done, it should look like this. Now here comes the fun part! Here's how you make the edge so pretty! Working form the middle of your pie crust, pinch the crust with your thumb and first finger. With your other hand, stick your first finger in the middle of the two fingers. Continue the same pattern all the way around the crust until the whole crust is fluted. Pour the apples into the pie crust. Measure out the ingredients to the filling: 1 C sour cream, 1 C sugar, 1 egg beaten, 1 t vanilla, 2 T flour. Whisk all the ingredients together and pour over the pie. Place in a 425 degree oven and bake for 15 minutes. While that's baking, make the topping. In a bowl, combine 1/3 C flour, 1 t cinnamon, 1/3 C brown sugar and 1/4 C unsalted butter. Using your hands, break down the butter until it's all incorporated into the dry ingredients. After 15 minutes, reduce the oven temperature to 325 and bake for an additional 45 minutes. After 45 minutes, pull the pie and sprinkle the topping all over the pie. Once the top of the pie is completely covered with the topping, turn the oven temperature up to 350 and bake for another 20 minutes.